Building on the company’s continued commitment to education and generational sustainability, Southwire recently welcomed the 2018-19 class of students to the Southwire Engineering Academy (SWEA), expanding the program to include a partnership with Carroll County Schools and marking the eighth year of the program’s collaboration with Carrollton City Schools. The Southwire Engineering Academy (SWEA) is a cooperative education program offered in partnership with local high school STEM programs. Combining a focus on science, technology, engineering and mathematics with hands-on experience and mentoring, SWEA empowers, inspires and prepares students for futures in engineering. In total, 33 students will participate in SWEA during the 2018-19 school year, spending the afternoon of every other school day at a Southwire facility with manufacturing leadership and engineers to contribute ideas and solutions to a variety of challenges and opportunities at Southwire. 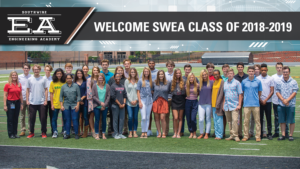 Five high school seniors from Central, Bowdon and Temple High are part of the first class of SWEA students from Carroll County. The project focus for this team will be utilizing technology to make information available at the point of use, and students will develop and implement solutions to help address the needs of the digital future. For more information on SWEA, visit southwireea.com.